You'll be £18.00 closer to your next £10.00 credit when you purchase Aircraft Carrier Victorious. What's this? The technical details of British warships were recorded in a set of plans produced by the builders on completion of every ship. Known as the ‘as fitted’ general arrangements, these drawings represented the exact appearance and fitting of the ship as it entered service. Intended to provide a permanent reference for the Admiralty and the dockyards, these highly detailed plans were drawn with exquisite skill in multi-coloured inks and washes that represent the acme of the draughtsman’s art. Today they form part of the incomparable collection of the National Maritime Museum at Greenwich, which is using the latest scanning technology to make digital copies of the highest quality. 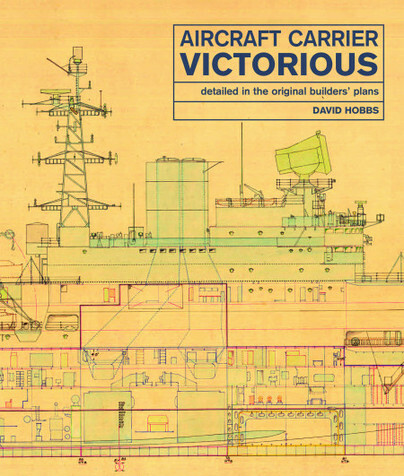 This book is one of a series based entirely on these draughts which depict famous warships in an unprecedented degree of detail – complete sets in full colour, with many close-ups and enlargements that make every aspect clear and comprehensible. Extensive captions point the reader to important features to be found in the plans, and an introduction covers the background to the design. HMS Victorious was a ship with two almost separate incarnations – as built in 1941 she was one of a new type of armoured carrier which saw strenuous wartime service; post-war the ship underwent a massive reconstruction lasting nearly eight years that saw her recommission in1958 as one of the best equipped carriers in the world, ready for another decade of duty. Both these phases of the ship’s life are fully documented, which allows this novel form of anatomy to cover two generations of carrier design. An excellent volume that benefits from an excellent quality-price ratio and that will be absolutely essential to all scholars and enthusiasts of this wonderful subject. This is the third volume in a series of books based entirely on the “Admiralty Draughts” which describe the Royal Navy’s warships in an unprecedented degree of detail in full colour. These drawings represent the exact appearance and fitting of each ship as it entered service. Extensive captions point the reader to important features to be found in the plans, and an introduction covers the background to the design. The aircraft carrier VICTORIOUS was a ship with two almost separate incarnations entering service in 1941 as one of the Illustrious class armoured ‘carriers which saw strenuous wartime service. Post war, the ship underwent a massive reconstruction in Portsmouth which lasted nearly eight years before she recommissioned eventually in 1958 as one of the best equipped carriers in the world. Aircraft carrier “fans” will love this beautifully produced and highly detailed book which is a pleasure into which to delve. Recommended.